Thin autumn jackets are forgotten, and real winter coats are out of the closets. 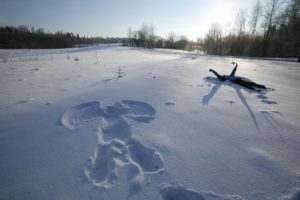 Soon the snow will cover the land like fairy dust turning Estonia into a magical wonderland full of endless possibilities. Welcome Nordic winter! Even when the days are shorter, and nights are longer there are still several things to do in Estonia to get that spirit up. 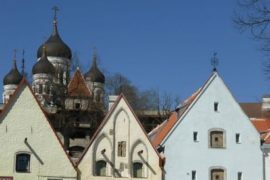 Try out some of these fun winter activities in Tallinn and Estonia. Estonia is a snowy country. Inevitably we started skiing because what else do you do with that much snow? 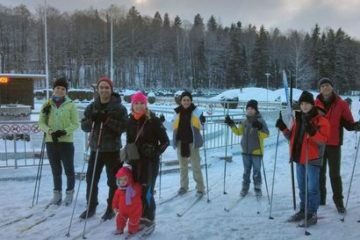 However, Estonia has no mountains so cross-country skiing was the only option. 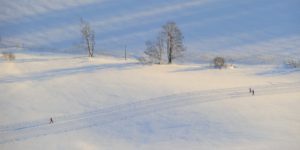 Skiing – the main winter activity in Estonia – is our national sport. There are several skiing tracks in and around Tallinn. It doesn’t matter if it’s your first time on skis or you are already a pro, it’s always fun and a very good workout. Come ski with us! 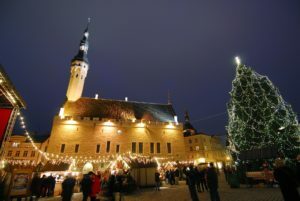 Christmas Market in Tallinn Town Hall Square is an annual event with small huts, traditional Estonian food, Santa Claus and weekend performances. A perfect place to find that Christmas spirit. During the wintry Old Town Walking Tour, we also visit the Christmas Market. 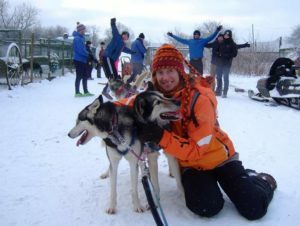 Spend a day out of Tallinn and meet the super friendly huskies at a dog park. 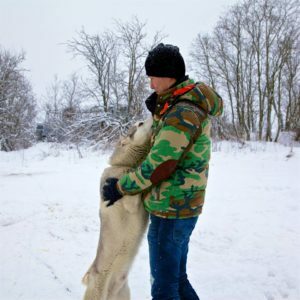 They are friendly, curious, snuggly and they lick you until you drop. 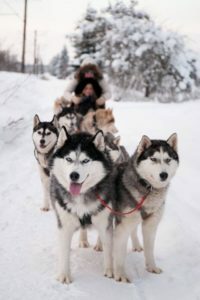 After that hop on a sled and fly along snowy trails behind a team of dogs. We will take you to the husky wonderland. Ice-skating is again something that Estonians are fond of. 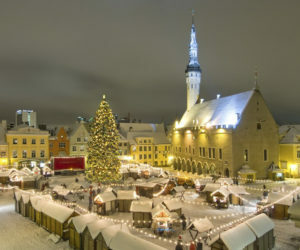 After doing some sightseeing in Tallinn Old Town hit the ice-skating rink on Harju Street or try those moves out on a frozen lake or bog pool. “Potato” is the magic word when it comes to any kind of traditional Estonian food. Mashed, fried, oven-baked or boiled potatoes topped with some sour cream, piece of meat and a salad on the side – that’s how we roll. During the Christmas season we have boiled potatoes with sauerkraut and blood sausage or pork. It might sound a bit bloody but it’s delicious and nutritious. 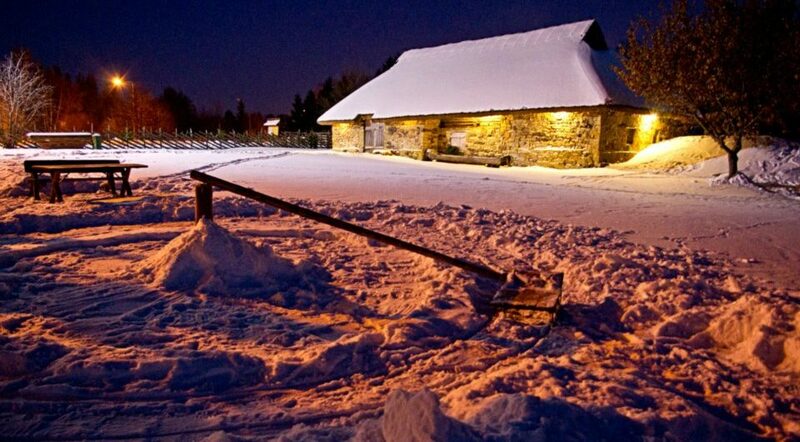 Try some traditional Estonian food out in Kaerajaan, Kolu Inn, Peppersack or Olde Hansa. My personal favourite Estonian food is “karask”. It’s a type of barley bread our ancestors ate only for special occasions. However, the poorest of the poor ate chaff-bread, with basically nothing more than chaff pressed into bread form. They say it was fit for nothing but to burn (and eat, apparently). When your toes are nearly freezing off your feet, it’s time to relax in a sauna. Saunas have been part of Estonians’ lives for centuries and we deeply respect them. To get extra healthy we also hop in an icy-cold water after a sweaty session on a sauna bench. We also have tons of spas in Tallinn, Haapsalu and Pärnu to keep our neighbouring Finns coming back again and again. When you feel a bit exhausted after touring in wintry Tallinn go sit down in a café, buy a hot cup of cocoa and just enjoy the moment. Our favourite snug and cosy places in Old Town are Chocolaterie Pierre, Bogabott, Kehrwieder and Anneli Viik Chocolates Café. It’s fun and cute. Bring the heavenly creatures to the Earth. 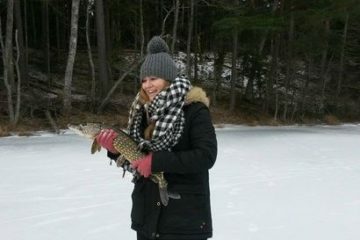 Drilling an ice hole and catching a fish while being surrounded by forests and pure nature is an unforgettable memory. That’s why we want to take you there. Winters in Estonia can get as cold as Viking’s hell. The temperatures can drop to -30 degrees in Celsius (-22 F). 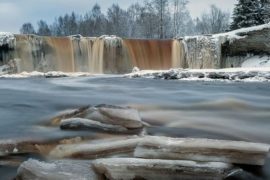 However, the water in the highest natural waterfall in Estonia refuses to cooperate already with warmer temperatures and freezes. 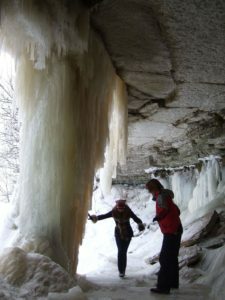 To our luck, the frozen Jägala waterfall is truly a spectacular sight. It’s even possible to walk behind the frozen wall of ice. 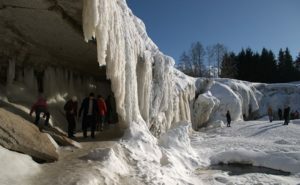 For the experience take a day trip from Tallinn or come on a two hour Frozen Jägala Waterfall Tour where we also serve a nice winter picnic. Making a snowman is the most important thing to do when the first snow comes. Building an igloo is a next level activity for true winter lovers. 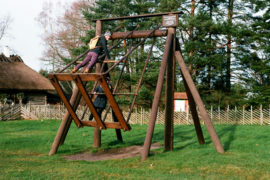 Test those engineering skills! Special offer for groups! 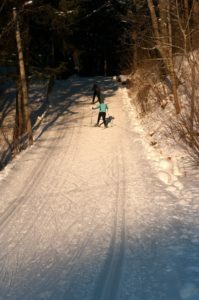 Combine your own winter activities day – kick-sledding, bog-shoeing, husky park visit, ice-skating, skiing. Pick two and ask us for the offer. 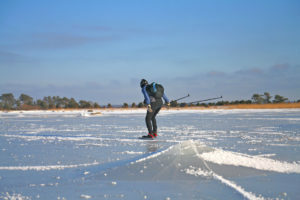 A wonderful winter experience out on the ice and the chance to try your hand at this Estonian pastime. 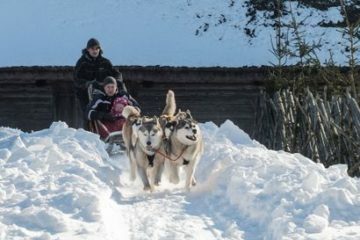 Experience Estonia’s winter wonderland as you fly along snowy trails behind a team of dogs. 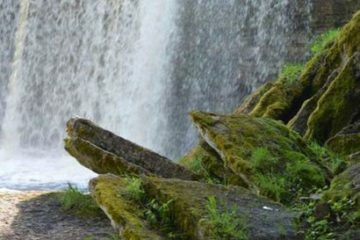 A slice of Estonian life, culture and history in a beautiful natural setting, the waterfall is a fantastic sight year-round. 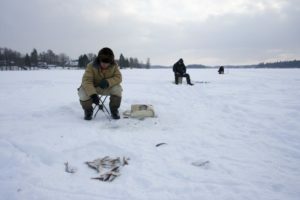 Try your hand at Estonia’s national sport and learn why Estonians are so passionate about winter. 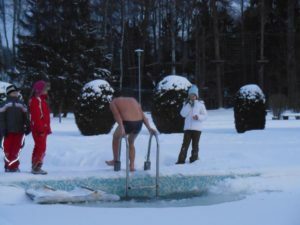 Next postWeather in Estonia – what is it really like?